The Yeakel Cemetery began as a private burial ground over 260 years ago. There is no single source of records one could refer to. However, through careful research a list of burials has been created. The main sources of information are The Genealogical Record of the Schwenkfelder Families and tombstone transcriptions. The number to the left of some of the names indicate immigrants. 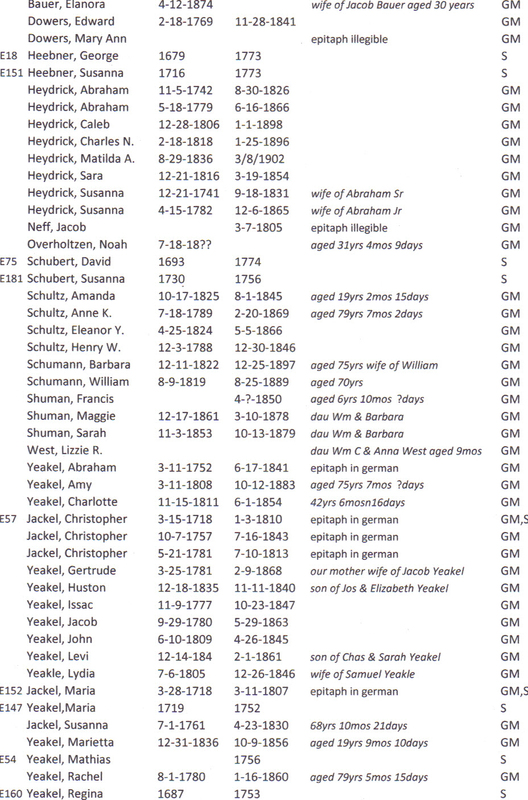 The numbers are identifiers created by the Schwenkfelders to help genealogists keep track of family groups. The letters on the far right indicate whether a grave marker is present (GM) and if the individual is listed on the Schwnkfelder monument (S). Is the cemetery listed on findagrave.com? Good question Steve. It is, but for some reason they chose to spell the name “Yeakle Cemetery”. Some of the Yeakels spelled their name that way. We like to spell it “Yeakel” like on the big monument. Careful with findagrave information, it’s sometimes wrong. If you need any specific info about the Yeakel Cemetery contact me any time. Historical and social information about these people. They clearly valued their family and relationships…I’d love to know more! Can you fill me in a bit more? I am so glad that I found this site. My 2nd Great Grandparent and 3 of their children are buried here. William and Barbara Schumann, Francis Shuman, Maggie Shuman and Sarah Shuman. I found it interesting that the parents names are spelt one way and the children another. Next time I am in the Philadelphia area I hope to be able to visit their graves. If possible I would greatly appreciate a picture of their headstones. Thank you so much. This site is so interesting. My Yeakel ancestors settled in the Columbia County area. Wondering from where the Yeakels of Old Germantown emigrated. Thank you for any information you might share.